Children’s minds are difficult to fathom. Children’s impulses, desires thoughts, ways of reasoning, their likes and dislikes preferences, etc. are very different from those of adults. A am extremely happy to publish this book titled ‘Embroidery Designs for Children’s Garments’ prepared with a view to giving scope and expression to children’s imagination and liking. I am very happy that my three earlier books on embroidery designs published by Gala Publishers were received well by the public. Inspired by this success. I have prepared this book especially with children in view. It contains new and colourful designs presented with a view to helping mothers in selecting a variety of designs for their children’s dress taking into account the tastes and choice of the young ones. Normally, it is the parents who make decisions regarding all matters pertaining to their children. But today’s children, who are more understanding at an early age, express their likes and dislikes frankly to their parents. Particularly, in the matter of their clothes, they express their choice quite firmly. In such cases parents have to bow down to their children’s wishes and provide them the clothes the children demand, even against their own will. This book provides ample guidance to mothers in preparing clourful and attractive clothes which their children will like. This book further explains through various diagrams and their verbal description how to embroider beautiful patterns in various types of stitches. Various methods of tracing the designs from the pages of this book onto the material have been given in this book. Clear instructions are given in the blending of colours for obtaining the desired shades. Thus fascinating and eye-catching embroidery can be done easily with the proper use of the designs given in this book and the guidance provided for executing them. These designs will also be very useful for painting in various colour mediums. I hope that mothers will prepare lovely and charming dresses with the help of the designs given here and make my work rewarding. 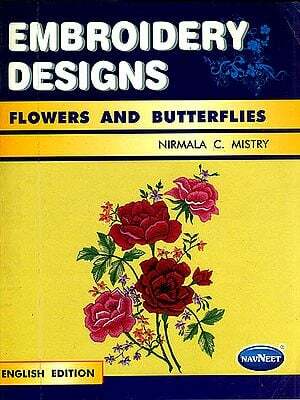 Finally, I am extremely grateful to Messrs Gala Publishers for publishing this my fourth book on embroidery designs. I am thankful to the publishers for giving me the opportunity of presenting to the public my scheme for training women at home in the at of stitching. I am particularly grateful to Shri Shantibhai Gala for encouraging me to prepare this book on designs for children’s clothes.